Preheat oven to 400. Pull off a length of foil that is twice the length of your baking sheet. Line your baking sheet, allowing half of the foil to hang off the end. 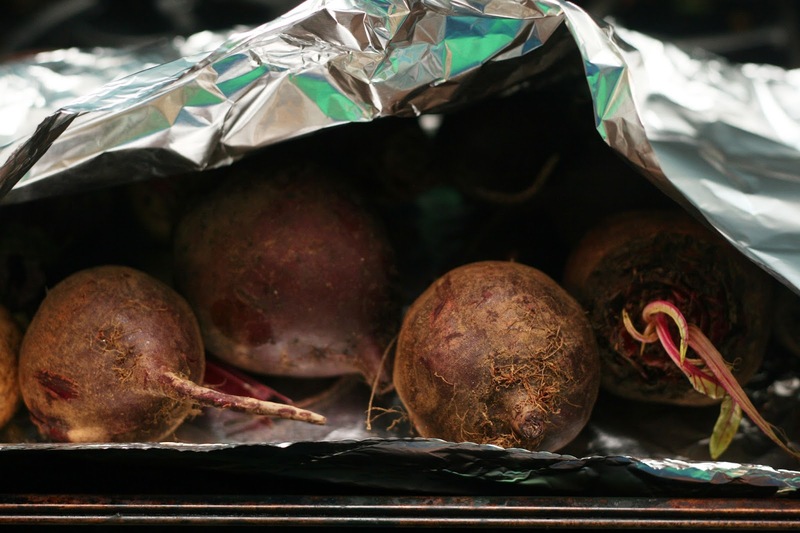 Place the beets on the foil in a single layer. Fold the foil over the beets and crimp close. Bake 45-60 minutes or until each beet is easily pierced with a thin knife. Allow to cool slightly. Use a paper towel to rub the skin off the beets. Eat or cook with immediately or refrigerate up to one week. *I used a mix of red and white beets (that pale guy on the end is a white beet. fun!) because that is what I had on hand. 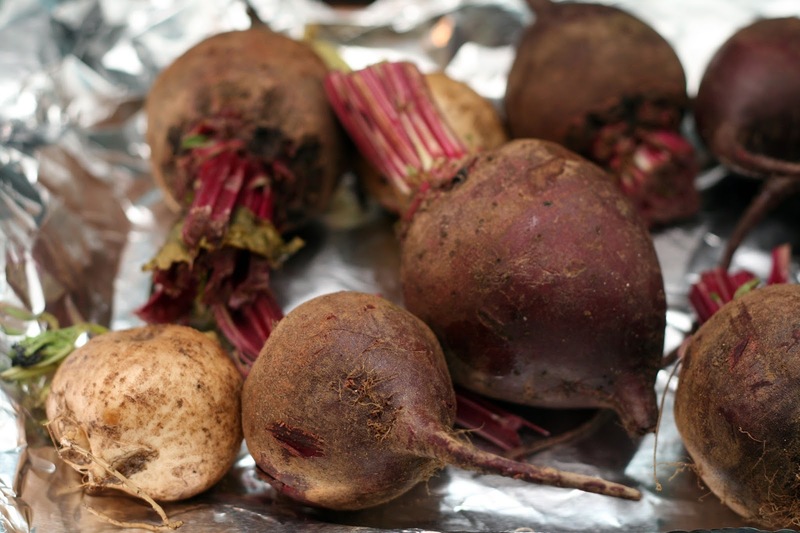 Smaller beets may cook more quickly than larger beets. If you have some nice beet greens leftover, I have a few recipes that use them. I keep a running tally of questions readers ask and when it reaches what I deem a critical mass, I try to do a how-to post. I haven't done one in a while but it was clear one was needed about roasting beets. I frequently call for cooked beets in my recipes and roasting is by far the easiest method. You can boil them but that takes just as long and you have a pot of boiling water on the stove that you have to make sure doesn't evaporate. I much prefer a hands-off method. I actually like roasting beets for recipes that call for me to saute them until tender. Sauteing beets until they are tender takes forever. I just roast up a big batch when I get a chance and refrigerate them until ready to use. Then I add them towards the end of the root vegetable cooking time or add them long enough to warm them through if they are the only root vegetable in the recipe. Added bonus? The skin slips right off of cooked beets; so you can avoid peeling the slippery, staining things with a regular peeler. Win-win-win.